Science fiction movies always have a way of teasing us with products that don’t yet exist, but which we wish were available now. We might not yet be anywhere near the day when we all have flying cars, and robots that do all of our housework, but we are about to see a much smarter vending machine. As much as we all love those wonderful machines that dispense our favorite drinks and snacks, we can all agree that there is still a little room for improvement. 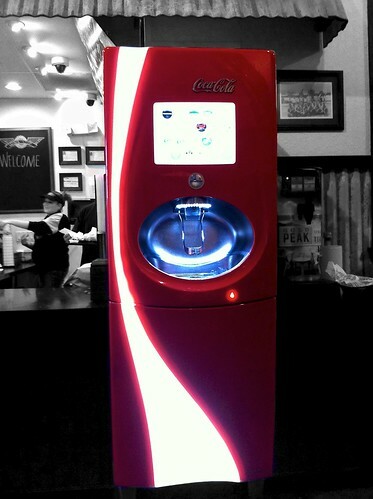 It seems that the good folks at Coca-Cola think so too, as they recently revealed the Coke machine of the future. The new machine comes equipped with a Core i7 microprocessor, has wi-fi capabilities, a rather impressive digital display, and a high-definition camera loaded on board. Think of it as an oversized laptop, albeit one that can dispense your favorite beverage if you shove a dollar inside. Oh, and for those of you wondering about that camera on the machine, you might just say it’s a preventative measure against those that get a little frustrated when the machine decided to keep your money as a souvenir. The camera serves a purpose other than catching vending vandals red-handed, and that is gathering information about the user. Don’t worry, we aren’t talking about some sort of retinal scan here, but the machine will ask you if you want a picture taken, which can then be used by Coca-Cola for demographic targeting purposes. The digital display on the vending machine will feature pictures of the drink choices, doing away with the buttons and flavor strips that we have all come to know and love. If you have ever used any of the new coke machines, like the one pictured above, that allow you to make different drink combinations, then you’ll have an idea of what we are talking about. The new machines are the brainchild of Coke and Intel, who of course were the brains behind the internal workings of the machine. This really does look like the vending wave of the future, and while they are only on display in South America at the moment, it is only a matter of time before they start spreading to other parts of the world. What this should tell you is that the world of vending is one that is constantly on the move, with more and more companies opting to sell their products via machines. This is a multi-billion dollar industry that seems to get bigger and better each and every year, and which is a solid investment for someone looking to start their own business. There is no need to wait for the next wave of vending machines to drop before getting started, as the ones that we see every day wherever we go still work perfectly fine, and are just as popular as ever.